Blaithwaite House at Blaithwaite Estate in Waverton, near Wigton, Cumbria sleeps 40 people. Blaithwaite Estate near Wigton is nestled in the beautiful Cumbrian countryside; Blaithwaite Estate is surrounded by 80 acres of estate grounds made up of 30 acres of gardens and grounds and 50 acres of woodland. 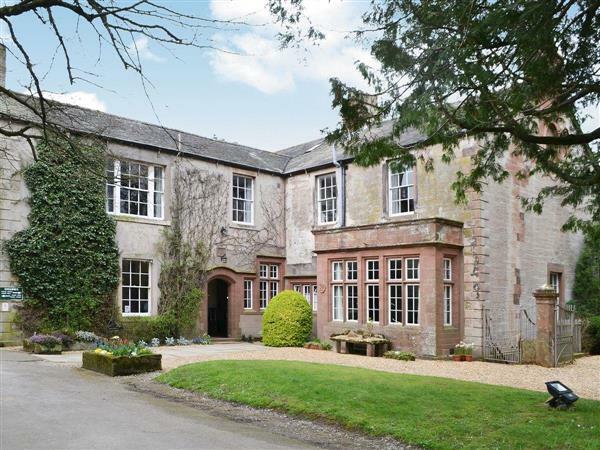 Blaithwaite House (ref UKC1358) is a Grade II listed, detached country mansion which has been in the same family since the 1700s and is now available for guests to enjoy. The spacious country mansion is awash with original features from original ceiling roses and exquisite fireplaces to stained glass windows which adorn the building, helping it achieve its listed status. Comfortable accommodation is provided for up to forty people, in single, double and family rooms. The bedrooms, all but one room with en-suite facilities, enjoy views down to the sprawling front lawn and rose garden or across the courtyard. Blaithwaite House has a formal garden with manicured lawns and a charming walled rose garden with a beautiful summerhouse set on an island. Blaithwaite Stables (ref UKC1359 [Blaithwaite Stables]) is the old stable building for the Blaithwaite Estate, and has been carefully renovated to a very good standard, while keeping characterful original features such as the old range, but don’t worry, guests have all the modern conveniences to cook with! Twenty people can be comfortably accommodated in eight rooms, all but one room are en-suite, and two of the ground floor bedrooms are wheelchair friendly. The Stables overlook the superb old courtyard with access to the beautiful orchard, miniature golf and garden chess set. The properties can be booked together to sleep up to 60 people. Blaithwaite House has step to the entrance. Formal Hall: With wood burner. Living room: With 27 Freeview TV, DVD player and CD player. Kitchen: With gas range, microwave, fridge, freezer and washing machine. Bedroom 1: With king-size four poster bed access to balcony and en-suite with shower cubicle and toilet. Bedroom 2: With king-size bed, single bed and en-suite with shower cubicle and toilet. Bedroom 3: With king-size bed, single bed and en-suite with shower cubicle and toilet. Bedroom 4: With king-size bed, 2 single beds and en-suite with shower cubicle and toilet. Bedroom 5: With zip and link super king-size bed (can be twin beds on request), 2 single beds and en-suite with shower cubicle and toilet. Bedroom 6: With zip and link super king-size bed (can be twin beds on request), 2 single beds and en-suite with shower cubicle and toilet. Bedroom 7: With zip and link super king-size beds (can be twin beds on request), 2 single beds and en-suite with shower cubicle and toilet. Bedroom 8: With zip and link super king-size bed (can be twin beds on request), bunk bed and en-suite with shower cubicle and toilet. Bedroom 9: With double bed, single bed and en-suite with shower cubicle and toilet. Bedroom 10: With double bed, 2 single beds and en-suite with shower cubicle and toilet. Bedroom 11: With double bed and en-suite with shower cubicle and toilet. Bedroom 12: With double bed and en-suite with shower cubicle and toilet. Bedroom 13: With single bed. Gas included. Large enclosed lawned garden with courtyard, terrace, garden furniture, summerhouse and barbecue. Please note: There are 15 steps, 33 yards from the mansion house, and an unfenced pond/small lake with the ornamental summerhouse, 66 yards from the mansion house. There are 3 other unfenced ponds within the 80 acres of grounds. Both properties: Biomass central heating, electricity, bed linen and towels included. Initial logs for wood burner included. 2 cots and 2 highchairs. Welcome pack. External laundry room (shared with other property on-site). 80-acres of natural grounds with mini golf and woodland (shared with other property on-site). Private parking for 20 cars. No smoking. For a better idea of where Blaithwaite Estate - Blaithwaite House is, you can see Blaithwaite Estate - Blaithwaite House on the map below. Blaithwaite Estate - Blaithwaite House is in Cumbria; should you be on the lookout for a special offer, you can find all the special offers in Cumbria. It's always worth checking to see what is on offer at the moment. Do you want to holiday near Blaithwaite Estate - Blaithwaite House (UKC1358), you can see other cottages within 25 miles of Blaithwaite Estate - Blaithwaite House; have a look to find your perfect holiday location.